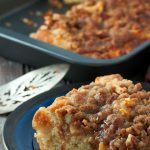 Soft, delicate cake with the crunchy, buttery top, this Apple Crumb Cake is an ultimately delicious dessert filled with tender-crisp apples flavored with a touch of cinnamon. While the cold weather is slowly making its way, seeping through our sweaters then into our skin, I take comfort in the fact that colder weather means lots of time to cozy up inside. To me, that translates directly to food, cooking and keeping warm with thick blankets and lots of movies. While I enjoy summer and our time outdoors- the camping, driving and sitting by the campfire, I am basically an indoor girl. So when the Fall season rolls in, I am okay. I will be in the basement, baking away. 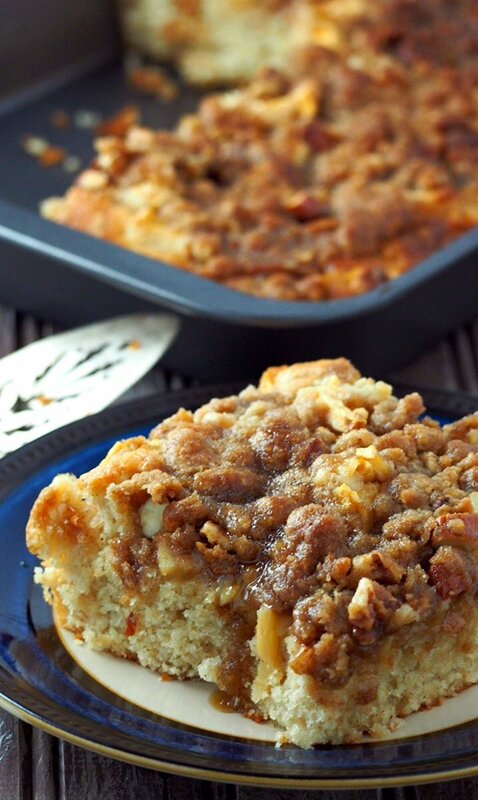 The smell of this Apple Crumb Cake shot directly from my nose right through my heart. I suddenly felt the comfort of my family being at home: my kids going up and down the stairs with their own little chatters while the smell of the apple cake enveloping us all in its warm, cinnamony aroma as it bakes. 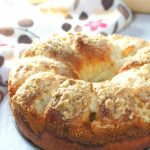 This apple crumb cake is basically a coffee cake that gets its wonderful moisture from sour cream. So if you happen to have a leftover tub of sour cream that you don’t know what to use for, this is it. 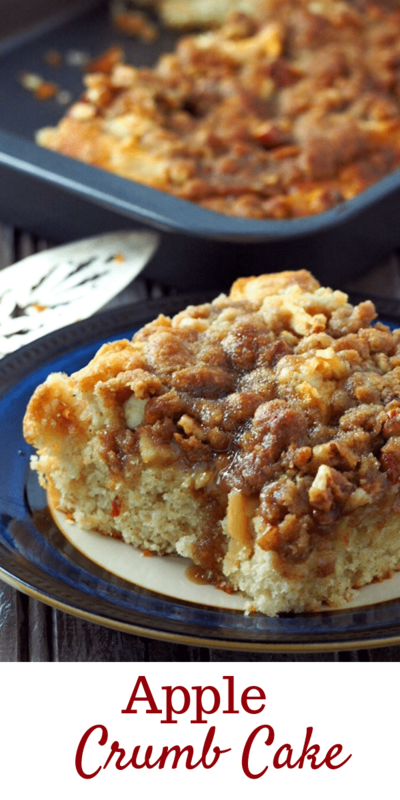 Grab apples and walnuts (or pecans/ almonds), and you will have this heavenly apple crumb cake to enjoy. I love every element of this cake. The soft delicate cake base melts in your mouth and is pleasantly sweet. 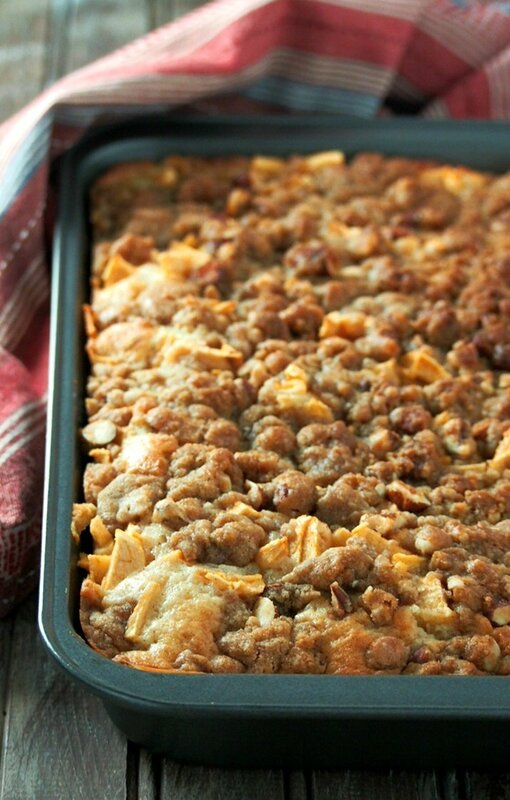 The apples add that tender, meaty substance and the crumb topping, oh the crumb topping is divine. With the chopped nuts, it adds just the perfect texture. This is a laid back kind of baking that you can do on a weeknight. Keep your stand mixer in its place. No need to dirty up lots of bowls. Whisk together the all dry ingredients in a bowl, then stir in the liquids- the sour cream, eggs and melted butter. 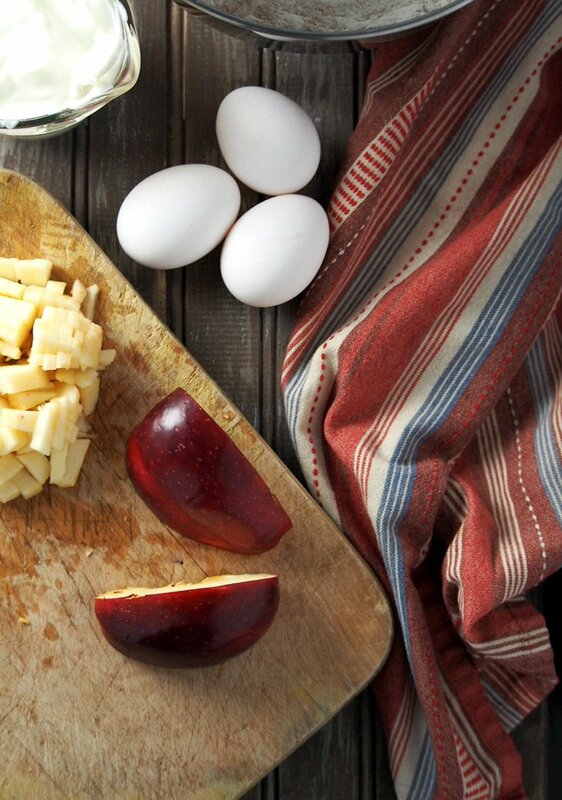 Stir by using a wire whisk to incorporate everything together. Pour and scrape the butter in a greased 9×13 baking dish. 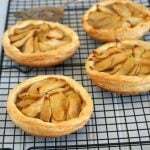 Scatter diced apples all over the batter. Now, make the crumb topping. 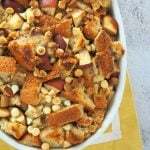 In a bowl, stir the ingredients for the crumb topping: brown sugar, flour, salt, cinnamon, melted butter, and the chopped walnuts. 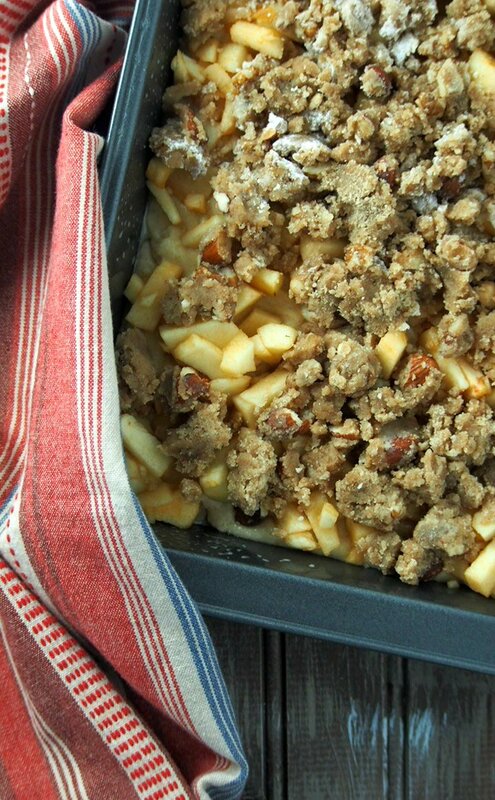 Drop dollops of the crumb toppings all over the diced apples in the pan. Bake the cake at 350 F for 35-40 minutes. The cake should be golden and set. The cake is fine without the brown sugar drizzle, but if you are in for an extra kick of sweetness, by all means, make the brown sugar glaze. 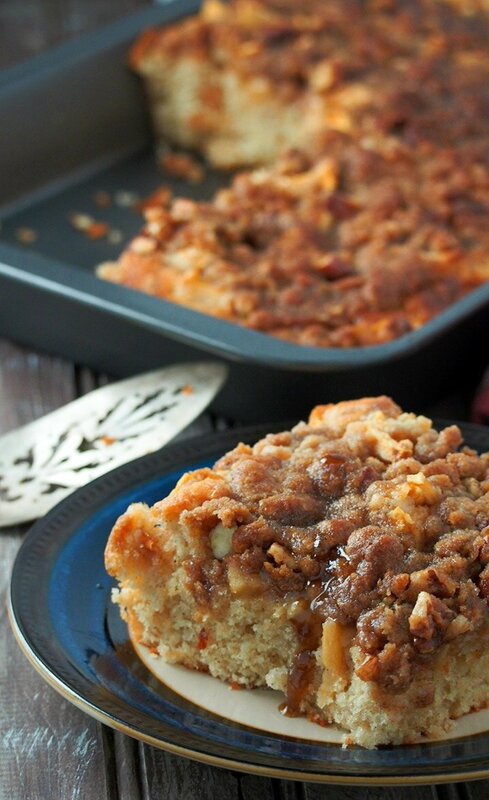 Served warm, this apple cake is pure comfort. After finishing a slice, you will find yourself wanting another one again. It is simply delicious, addictive and a joy to eat. This cake stays moist and soft for days. Have it with your coffee or for dessert. Enjoy the warmth and coziness within in this cold Fall weather. 2 red apples peeled, cored and diced finely. Preheat oven to 350 F. Grease a 9x 13 baking pan. 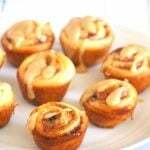 In a large bowl, whisk together flour, sugar, baking powder, baking soda, cinnamon and salt. Stir in melted butter, sour cream and eggs. Pour and scrape the batter into the prepared pan. 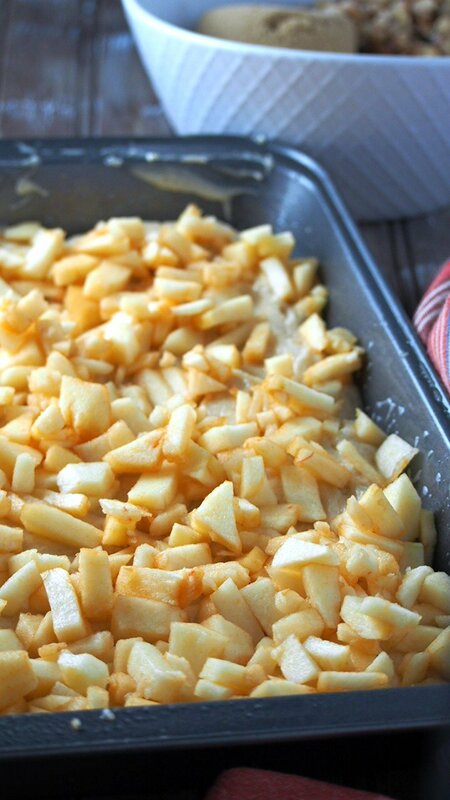 Lay the diced apples on top of the batter, spacing them evenly across the entire surface. Make the crumb topping: Combine flour, brown sugar, melted butter, walnuts salt and cinnamon in a medium bowl. Stir until all the ingredients are incorporated. Drop dollops of the crumb topping all over the apples, distributing them evenly. Bake the cake for 35-40 minutes, or until the cake is set and a toothpick inserted at the center of the cake comes out clean. Let the cake cool slightly, then drizzle the brown sugar glaze all over the cake. In a medium saucepan bring the brown sugar and water to boil. Let it simmer until the sugar is dissolved and the mixture has thickened slightly. Stir in the vanilla extract. Drizzle over the cake.